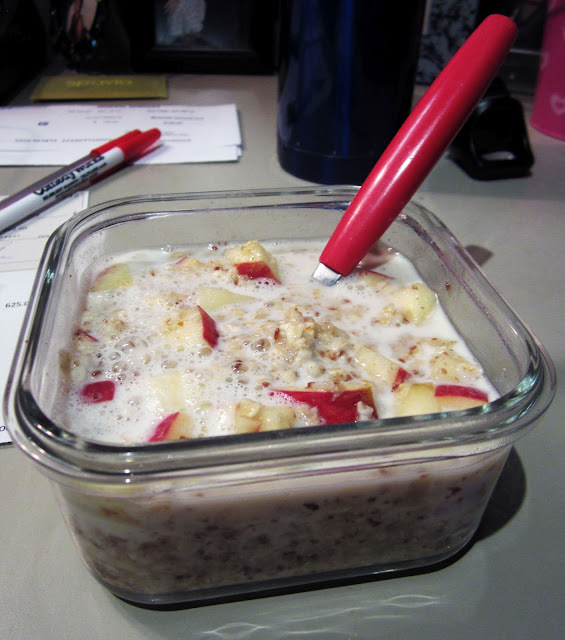 Beth's Super Awesome Blog: Easy on-the-go Breakfast Idea! Lately I've been rushing out the door to get to work. I've been sleeping late, and I absolutely hate skipping breakfast! I found a container of plain instant oats in one of our cupboards, and thought I'd make some use of it. I usually try to eat non-instant oats (they take about 15-mins to cook on the stove), as they're healthier, but sometimes you gotta just use what you have (especially when you're in a rush). Also I never like letting food go to waste! I used to eat the instant oatmeal packets when I was a kid - I remember loving the brown sugar kind from Quaker Oats. But they're so processed, and you can't control the amount of sugar & salt that's in it. Yes, it's a convenient serving size, but this is a much healthier way to do instant oats, and it only takes a few minutes longer! 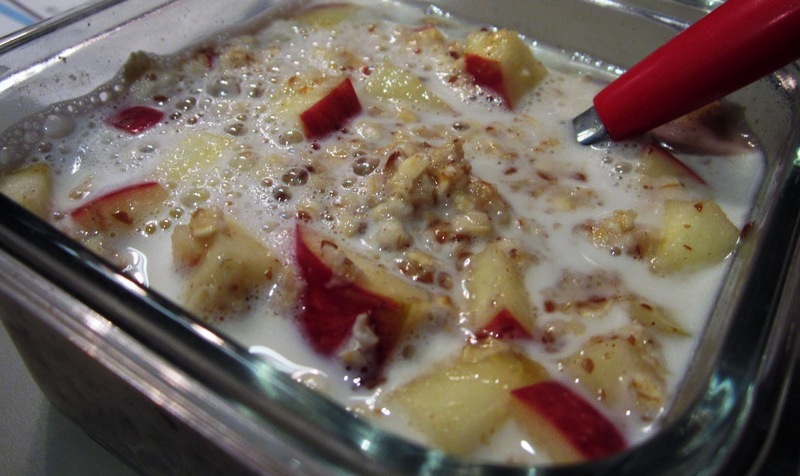 Mix all ingredients together, and place in a heat-safe container (glass is preferable instead of plastic). When you get to work, turn on your water-boiler (I keep one on my desk for tea, coffee, and oatmeal), and fill to the top. Just eyeball the amount of water to add - I like mine a little thin, so I eyeball about 1/3 to 2/3 a cup. If you don't have a water-boiler, just add cold water & microwave for about 1-2 mins. the fridge at work right before eating for a little added yumminess.